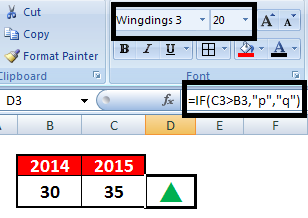 This tutorial explains how to create interactive up down arrows with excel. 2. Enter CHAR(200) and change the font to "Wingdings 3", you will see Down arrow. Click on "Next Rule" and select "Use a formula to determine which cells to format" and enter the following formula and click on "Format" and go to "Font" tab and select Red color and then click on OK. Create a new rule - Click on "Next Rule" and select "Use a formula to determine which cells to format" and enter the following formula and click on "Format" and go to "Font" tab and select Green color and then click on OK.
2. Enter q and change the font to "Wingdings 3", you will see Down arrow. 0 Response to "Excel : Interactive Up Down Arrows"